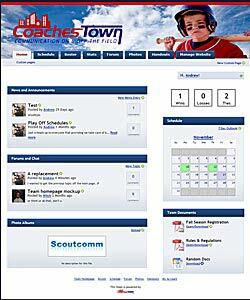 CoachesTown.com is as robust and complex as any major website to date. CoachesTown features online scheduling and communication tools that allow single teams or entire 500+team organizations to quickly and effectively schedule, make changes and exchange information. CoachesTown also integrates a custom-built online registration system complete with customizable registration forms and online payments. This website is one of the most elaborate, sophisticated websites I have had the pleasure of working on. From ajax to eCommerce, CoachesTown covers the entire spectrum of my skills -and pushed them to the limit.